4/15 Cup of Coffee: The PawSox were the only affiliate to come away victorious on Sunday. 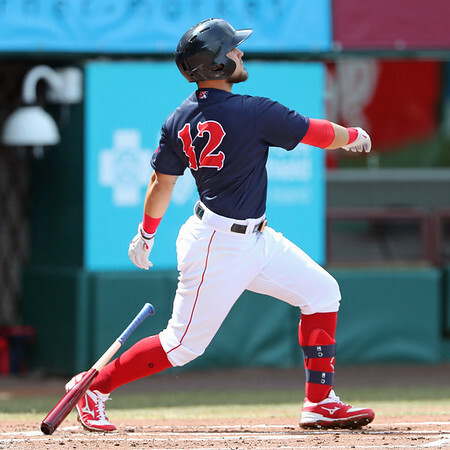 Sixth-inning homers from Michael Chavis (pictured) and Josh Ockimey and a three-hit day from Rusney Castillo led the way at McCoy Stadium. Greenville fell in a slugfest, Portland's early-season woes continued, and the rain did not cooperate in Salem. The day after breaking out of a week-long slump with a 470-foot homer, Michael Chavis followed up with a 467-foot blast that broke a 2-2 tie. It's the third home run of the season for the organization's top prospect, to go along with a single. Two batters after Chavis's sixth-inning homer, Josh Ockimey ripped a two-run insurance shot. Rusney Castillo was 3 for 4 with a double, bringing his average to .294 as his embarks on his quest for a third-straight .300 season. Ryan Weber got the start, allowing two runs on six hits in five innings. Travis Lakins was impressive in relief, striking out two in a perfect eighth inning. Bobby Poyner worked around a pair of walks in the ninth to earn the save. The rough start to 2019 continues for Portland, who drops to 1-6 on the year. Denyi Reyes got the start, allowing five runs (four earned) on five hits in three innings. Reyes issued an extremely uncharacteristic five walks: the righty did not walk more than two in any of his 27 appearances last year. Zach Schellenger also struggled, giving up four runs on three hits in only 2/3 of an inning. Schellenger walked two batters and hit another. Keith Curcio, signed as a minor league free agent after spending 2018 in independent ball, made his Sea Dogs debut. He started in center field and went 1 for 4. The final game of the series at Haley Toyota Field was a washout. The contest will be made up when Frederick returns on Friday, June 14. A six-run fifth inning doomed Greenville in Sunday's slugfest. Triston Casas continues to heat up, ripping a double to extend his hitting streak to five games. Casas also started his second straight game at third base after appearing only at first base in his first eight games of the year. Alan Marrero hit a three-run homer in the fourth, his first round-tripper of the year. Starter Brayan Bello allowed a run on four hits in four innings, striking out one and walking three. Yoan Aybar, who impressed in spring training and in his first three outings of the regular season, had a rough go on Sunday. The lefty did not retire any of the six batters he faced, walking a pair and allowing a double and two singles. He was saddled with six runs and the loss. Player of the Day: Though contract considerations have kept Rusney Castillo in Triple-A, he has been a consistent performer in Pawtuket, a trend that appears to be continuing in 2019. The outfielder turned in his first three-hit game of the season after registering three such efforts last year. Dating back to the start of 2017, Castillo has a .316/.354/.457 slash line.